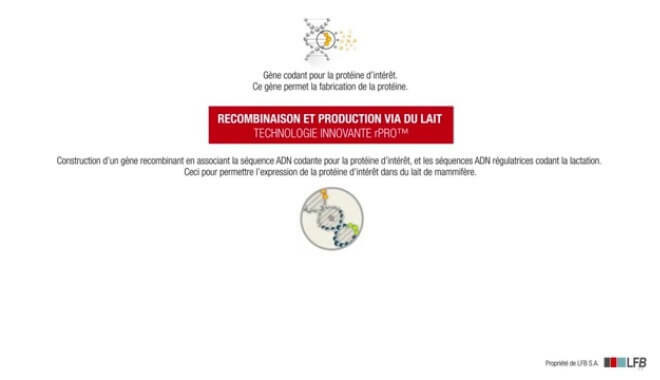 The rPRO™ platform, a disruptive innovation, uses genetic recombination to express a protein in mammal milk that can be used in human medicine. The protein is then isolated, purified and made safe using the highest pharmaceutical standards. rPRO™ is a robust, productive technology, with an excellent economic profile, largely because it increases production greatly while keeping costs down. For this reason rPRO™ may help to improve access to medicinal products to the largest number of patients. Two recombinant medicinal products have been produced on the rPRO™ platform. LFB’s recombinant antithrombin, marketed in the USA by the subsidiary rEVO Biologics, has also been registered in Europe. A recombinant activated Factor VII, produced by rPRO™ – eg the entity Eptacog Beta -, is under phase III development. The Biologics License Application (BLA), requesting marketing approval for the product is being reviewed by the US Food and Drug Administration (FDA). LFB’s activated Factor VII, if approved, would be the first alternative in the context of treatments using Factor VIIa in over 20 years. rPRO™ technology is used by the US subsidiary LFB USA, which is developing and producing recombinant proteins with this platform. The bioproduction site of LFB USA devoted to recombinant proteins, is located in Massachusetts (USA).